Avoiding technology is inevitable today because no matter what field and profession you belong to, technology has its interference there and it is going to make things easy for you. How students perform and what they learn in the classrooms is directly related to how a teacher is teaching in the classroom. However, there hasn’t been much done for teachers to improve their performance in the classroom as much as there has been done for students. The SMART interactive whiteboard attempts to achieve this goal though. This is a whiteboard that can help teachers revolutionize the way they have been teaching using the old and conventional whiteboards. What Is SMART Interactive Whiteboard? SMART interactive whiteboard is made by SMART technologies, which is a name known for making the best interactive whiteboards all around the world. These whiteboards look just like the old whiteboards but are completely different things. These boards are connected to computers. The computer is connected to a projector. The projector picks the screen or display of the computer and shows it on the whiteboard surface. The best and unique thing about this setting is that the teacher or instructor is then able to control everything from the whiteboard instead of using the computer. 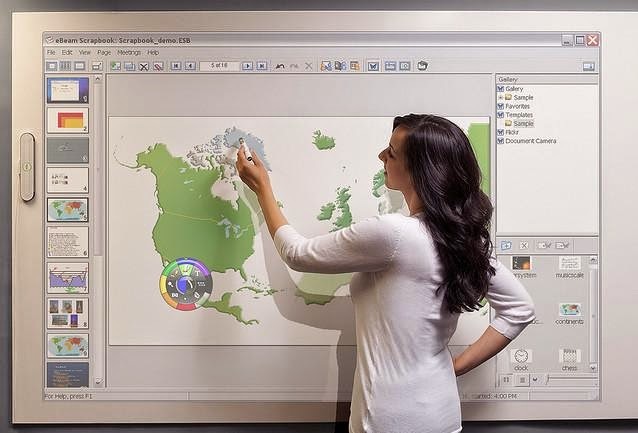 Interactive whiteboards give an opportunity to teachers to step with the world as it speedily moves forward in terms of the use of technology. It makes teachers more effective in their lectures by giving them more power. The interactive surface allows teachers to write, draw, drag, drop and remove anything from the surface of the whiteboard as they have been doing on conventional whiteboards. However, there is much more than these interactive whiteboards can achieve. Since they are connected a computer they can be used just like a computer. The teacher is able to use a pen to control and draw or remove anything on the surface of the whiteboard. He can use graphics, videos and sounds to make his lecture more effective. He doesn’t have to draw the complex machines, shapes or graphs on the whiteboard since everything can be downloaded from the internet and shown on the interactive whiteboard. Teachers can use one or all of their fingers at the same time to do many things simultaneously on the whiteboard. This is a feature that you will not find on every interactive whiteboard but Smart interactive whiteboards boast this particular feature. Teachers are able to take feedbacks and answers from the students using the interactive whiteboard and show the results on the whiteboard as well. Correct answers can be rewarded with downloaded applause and clapping from the whiteboard as well. Teachers can use these boards with the help of their fingers as well. The best thing is that the software required to make this whiteboard work easily integrates with MS word and other popular applications. Not to mention, the recent studies and researches have proved that the performance of students also get better when they are taught with the help of interactive whiteboards.